Now that the preps are over, we can go over some of the questions pertaining to each horse and what they have to do and prove on May 3. With him, it’s whether he is as effective outside California, especially not having a work over the Churchill Downs track, and how he’ll take dirt in his face. Because of the track he’s been running over and the setup of his races, he is one horse who will need to break alertly and get a good position going into the first turn. Once he can establish his position and put himself in a comfortable spot and appears to be handling the track, it will be his race to lose. Despite what some think, he should have no problem getting the mile and a quarter. Cal-bred or no Cal-bred, his pedigree top and bottom is as strong as anyone’s and is inundated with 1 1/4-mile and 1 1/2-mile grade/group I influences from America and Europe. Once he turns on the afterburners at the five-sixteenths pole, we should know right away what we’re in store for. His last work, a half in :47 4/5, was once again flawless, as he did it all on his own with his ears pricked the entire length of the stretch. It seems as if everything is coming so easy to him now, as indicated by his four straight huge Thoro-Graph numbers. It seems as if this horse doesn't know what the word "bounce" means. He got caught up in the California Chrome jetstream in the Santa Anita Derby and was able to hang with him in the stretch and not lose any ground, while pulling away from the others under no urging in the slightest from Mike Smith, who threw a single cross and then just sat on him the rest of the way. Now he’s on his own after getting that free ride. That was the rehearsal and California Chrome and the others can expect to see a much more formidable opponent in the big show, stretching out in distance, which he should appreciate, and taking advantage of a much faster and more contentious pace. The question with him is simply is he fast enough? He’s out to break the Apollo curse and has crammed five races in this year, and will be making his third cross-country trip. So, for a horse who didn’t start at 2 (remember, he was entered on Nov. 22), he seems like a seasoned pro who has been battle-tested and tried on different types of tracks on both ends of the country. His gallop-outs have been sensational and he hopes to use that late momentum in the final furlong when the race is won or lost. He’s not going to dazzle you, but he’ll run all day and will keep coming at you. I’ve been touting him since his maiden score, when he found another gear late and galloped out like a powerhouse, and each step since then has brought him up to the Derby ready for a peak performance. I decided to move him up for one reason. Unlike most of these horses, he has the potential to be something special if that last race, which defied all logic, was for real. Horses just don’t do what he did coming off one mediocre sprint effort in 8 1/2 months. Every time I watch the race the more impressive he looks. And what if it wasn’t a fluke? What if this is who he is? If it was a fluke or the Oaklawn 3-year-olds are not as good as we thought, then that means Will Take Charge is not very good either, considering they ran pretty much the identical time, and his :12 1/5 final eighth is motoring, regardless if he had an ideal ground-saving trip. His closing burst was confirmed by his powerful 106 late pace figure on Brisnet. His Thoro-Graph number was not as spectacular as one might think, but was still fast enough and big enough of a jump from his previous start without being too big where he might bounce in three weeks. This way he leaves himself with some room for continued improvement. The colt’s physical therapist, Carol Seaver, said she’s really been impressed with his development, both physically and mentally, in the last couple of months, especially the way he has muscled up and begun handling his training. He’s much more focused now and emerges from his breezes stronger, without appearing stressed or taxed by the effort. We’re well aware that some 3-year-olds really blossom this time of year, and it appears as if he could be one of those who is coming around at an extraordinarily quick pace and peaking at the right time. As for stamina, his half-brother won the 1 1/2-mile Tokyo City just a week before. If he can handle the three-week turnaround, who knows? Just remember, Pletcher’s best finishes in the Derby have been a win, two seconds, two thirds, and a fourth, and five of those six horses came into the Derby off three week’s rest. So, the big question is: do we really have any idea what we’re dealing with? Sure, he could regress big-time off that effort. We’ve seen one-hit wonders in the Arkansas Derby before. But then again, maybe he won’t, in which case everyone could be in for another surprise. Well, we know he’s wicked strong at Aqueduct and Belmont and we know he was a bust at Gulfstream, so how does he do on neutral ground, such as Churchill Downs? It seems much more like a case of not liking Gulfstream than being a New York horse. But even if he does handle Churchill Downs the same way he handled Aqueduct, how is he going to behave in front 100,000-plus fans when he gets to the starting gate, where he was not exactly on his best behavior before the Holy Bull Stakes. If he is free of his gate issues, he looks to be the most serious deep closer in the race. But his stretch run in the Wood Memorial, as powerful as it was in the final sixteenth, was not without its flaws, as he seemed unfocused, gawking to the outside and continuously drifting out. He was also late changing his leads. Once he switched leads and got into some kind of rhythm late, he blew right on by Social Inclusion and Samraat and quickly opened up. He wasn’t much better in the Remsen, shying noticeably from a left-handed whip on a couple of occasions. The key for him is to get his act together down that long Churchill stretch and not save his best running for the final sixteenth, which is where he leveled off in the Wood and the Remsen. He has the closing punch you want to see in the Derby, but he has to utilize it without any of the theatrics. Many feel this colt is a cut below the best and is kind of one-paced who will find the 1 1/4 miles beyond his scope. And in his present running style, there appears to be validity to that. But I have him ranked this high in the hope and belief we are going to see the original version of General a Rod; the one who came from far back and blew his field away in the blink of an eye at the three-sixteenths pole in his career debut, even if it was on Keeneland’s Polytrack. The key I feel are his blinkers. They were fine in order to hone his speed over the Gulfstream Highway, but does he really need them anymore? That is for Maker to decide. I’m merely wondering. Maker has been tinkering with them and likely will make more changes for the Derby. I normally do not like a major equipment change before the Derby, especially with blinkers, but if Maker decides to actually remove them, the colt could just revert back to the horse we saw at Keeneland. Blinkers off going 1 1/4 miles does not seem as drastic a change as blinkers on. Or he could revert back without a blinkers change, just by getting sucked back to midpack of a 20-horse field loaded with speed and be forced to come from off the pace. At his price, it’s at least an angle. And remember, this colt has plenty of stamina. His sire is by a Kentucky Derby winner. His broodmare sire is the sire of a Kentucky Derby winner and is a major source of stamina. His third dam is a half-sister to a French Derby winner. And his fourth dam is a half-sister to an undefeated Kentucky Derby and Preakness winner. With so many horses having question marks, he at least has been battle-tested several times against one of the gutsiest colts in the country and gives you 100 percent every time. He remains sharp, breezing five furlongs in :59 4/5. There is one major question regarding this colt, but it’s an important one: can anything be done to stop him from crossfiring? It’s simple really. If he crossfires again in the Derby he’s not winning. If he doesn’t, he has a big chance. You cannot become discombobulated and have your back legs out of sync with your front legs in a 20-horse field and expect to win or even be around at the finish. The one good thing is that if there is a way to prevent him from doing it, Pletcher will find it between now and the Derby. Mike Smith tried in the Louisiana Derby and the colt shot to the rail like a car blowing its left front tire. He remained stuck on his left lead and had no action until he finally got himself back in gear, switched over to his right lead, and finished up nicely to be second and galloped out strongly. So all things considered, he still finished in front of a number of good horses, and now gets Johnny Velazquez, who you can bet will be aware of the situation. This colt has the talent, the closing punch, and the turn of foot to be a major factor on May 3. Here is why he is more than capable of winning the Derby on his best day and best behavior: His 111 Brisnet late pace figure in the Remsen is the highest of any horse in the field. Two races later, in the Risen Star, he ran a 108 late pace figure, third highest of any horse in the field. Thoro-Graph also shows a similar pattern, as he is the only horse in the Derby to have run a negative number on dirt (in the Risen Star) and still regressed to only a “2” in the Louisiana Derby even with his miscues. Based on both these patterns, he’s ready for another huge closing effort, as long as he keeps his wheels aligned properly. This colt has an interesting distinction. In the first Derby Future Wager back in November, of the 23 individual betting interests, he is the only one remaining who currently is in the starting Derby field. The only other one with a chance of getting in is Pablo Del Monte. This colt definitely has earned his way in, scraping and clawing and picking up stray points wherever he could get them. The bottom line with him is that he’s run nine times (God bless him), has finished in the money in eight of them, and was a close fourth in his other start. This year especially, we need a good old-fashioned runnin’ hoss who gives his all every time. He’s finished in the money at 5 1/2 furlongs, six furlongs, one mile, 1 1/16 miles, and 1 1/8 miles. He’s hit the board in six stakes, and with Cairo Prince gone, is the only 2-year-old dirt horse of note still on the Derby trail. All winter, I’ve been waiting for him to return to his Champagne Stakes running style, making that one big run. He needed to get as far off the pace as possible, and he finally succeeded in the Arkansas Derby, going six wide at the head of the stretch and rallying out in the middle of the track for second. Although I would have loved to seen Jon Court stay on him, getting Calvin Borel certainly won’t hurt his chances, but it will hurt his price. Expect to see him even farther back than he was in the Arkansas Derby. Speaking of strides and lead changes, this guy needs to be more consistent in his lead changes. Some races he’s fine and others he’s not. He changes leads fine in the morning, but he has a tendency to lean on horses in the stretch and gets stuck on that left lead. Violette has impressed upon jockey Jose Ortiz the importance of changing leads, especially in the Kentucky Derby. This is no deep closer who gets rolling and stays on his left lead. As a pace presence who expends energy early, there is no way he can afford to remain on his left lead and hope to be right there at the finish. He gained valuable experience in the Wood Memorial and had to do a lot of the dirty work, first putting Kristo away and then chasing Social Inclusion, who got loose nearing the top of the stretch. He ran hard as usual trying to catch him, again leaning in on his opponent, and never saw Wicked Strong flying way out in the middle of the track. This is a horse who came out on top of the three-horse stretch battle in the Gotham Stakes without even being touched with the whip, and has twice gotten the better of Uncle Sigh in stretch battles, so we know he has a lot of fight in him. The Wood was his first career defeat, but an excellent learning experience, battling between horses for the first time. So, his trainer said after the Blue Grass he doesn’t want to go to the Derby and that this isn’t a dirt horse, and he flies him back to California. So, of course, five days later he’s in the Derby. Welcome to Derby fever. I believe he should be in the Derby, but one does have to take into account and respect the trainer’s comments. If he says he’s not a dirt horse and the Blue Grass was the race they were point for, who is going to disagree with him. Let’s not forget, however, that he did finish second in last year’s grade I FrontRunner Stakes on dirt, and although that was not a very strong race in general, he was second and it was on dirt, so it’s not like he doesn’t handle it, even if he handles synthetic better. And we all know by now that the Churchill surface is conducive to synthetic horses. According to Trakus, in the Blue Grass Stakes, the runner-up, Medal Count, raced 31 feet farther than he did. But, although Medal Count got the jump on him on the far turn, he accelerated quickly right behind him and blew right on by him in the upper stretch before drawing clear to win impressively. He still is the only horse coming off consecutive triple-digit late pace figures on Brisnet. California Chrome did it in the state-bred King Glorious and Cal Cup Derby. So, even if Eurton is right about him being a synthetic horse, and he probably is, he still possesses a powerful closing punch and is another horse who appears to be peaking at the right time. The big question he has to answer is can he make up almost nine lengths on California Chrome and 3 1/2 lengths on Hoppertunity. He’s only won two of his seven career starts, and the best horse he’s beaten has been Chitu, who is a talented colt, but not among the elite at this point. It’s obvious he needs to take a huge step forward. But all in all, he’s put together four straight solid efforts, assuming he was just short in his last race, and he has the ability to remain fairly close up and still put in a strong run at any point in the race. Being by Candy Ride, he should have plenty of room for improvement. Gary Stevens has now ridden him three times, so he should know everything about him he needs to know, and being a naturally aggressive rider, he will have him in a desirable spot, probably somewhere near midpack. He’s a powerfully built colt who likely needed his last race, and it will be interesting to see him train over the Churchill Downs surface. While on the subject of lead changes, he is another who is quite erratic. He usually has no trouble switching when he’s supposed to, but does have a habit of jumping back to his left lead in the final furlong. The other question, as mentioned earlier, is that :13 3/5 final eighth in the Louisiana Derby after being left alone on the lead through soft fractions and pretty much having his own way throughout. Give him credit for rebounding off the Risen Star Stakes and taking it to them right off the bat and rating nicely on the front end. Rating will be the key factor to his success. There is no questioning his brilliance and natural ability. It’s just a matter of how far he can carry it. He actually has proven his ability to rate off the pace and be effective, so he’s certainly not one who will be committed to the lead. His Thoro-Graph numbers are not quite what you would think. He’s run a “1/2” in three of his last four starts, making him the most consistently fast horse in the race. It actually was his romp in the LeComte coming off his runaway maiden score that was his regression race and not the Risen Star. So now that he’s paired two huge numbers, there is no reason why he shouldn’t run another big race on May 3 off a five-week layoff. If it wasn’t for his habit of switching leads and his slow final eighth in the Louisiana Derby, I would consider him a very live longshot. This colt could have a great deal more natural talent than most people think. Although he ran 31 feet farther than Dance With Fate in the Blue Grass, and although trainer Dale Romans seems as high on this horse as any 3-year-old he’s ever sent to the Derby, his last two starts on dirt, both in graded stakes company, were nothing to get excited about. He stopped abruptly in the Breeders’ Cup Juvenile, and Top Billing blew by him on the far turn of the Fountain of Youth Stakes like he was moving in slow motion. But he did make an early move between horses on the backstretch through some swift fractions and galloped out with great energy, so there was something to take away from that race. So, frankly, I’m torn with this horse. When Romans gets excited over one of his horses, as he’s done with him, you have to pay attention. I just need more convincing he’s going to be effective on the dirt and can handle making three starts in 29 days. For now, I will remain open-minded and will watch him train, although with all the horses falling off the Derby trail, the race is beginning to look more and more like a crap shoot, with the exception of California Chrome. One thing he does have going for him is his negative Thoro-Graph number in the Blue Grass (because of the grround loss), and that was coming back off only eight days. With the depleted crop of 3-year-olds reduced to a mad scramble, there is very little separating the bottom five horses with those right on the bubble, such as WILDCAT RED, UNCLE SIGH, COMMANDING CURVE, TAPITURE, SOCIAL INCLUSION, BAYERN, PABLO DEL MONTE, CHITU, VINCEREMOS, and RING WEEKEND. I am concentrating on closers right now, and seven of these 10 want to be on or close to the lead. Commanding Curve originally was headed for the Top 12, but no one seems to be dropping out willingly, so I will wait until he is officially in the body of the Derby field before using a spot on him. 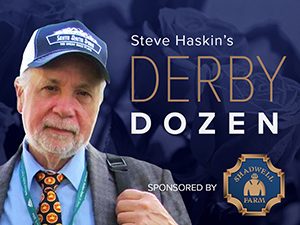 As crowded as the infirmary is getting, he may not have long to wait Last Year, Dallas Stewart was in a similar position with Golden Soul and look what he wound up doing in the Derby. First off, on a realistic note, don’t be deceived by his fast-closing third in the Louisiana Derby. Remember, they came home in :13 3/5 and he made up only 1 1/2 lengths, so it’s not like he was flying home, despite what it looked like visually. What he has going for him is his steady improvement. His sixth in the Risen Star actually was better than it looks on paper, as he lost ground fanning five-wide at the head of the stretch and switched back to his left lead at the sixteenth pole, so that was more of a learning experience in his first stakes appearance, coming off a maiden score, and making his first start in three months. For what it’s worth, he’s finished 1st, 2nd, and 3rd in his three starts at Churchill Downs. The names in his immediate family aren’t going to blow you away, but his sire is a son of A.P. Indy who won the Meadowlands Cup. His broodmare sire is out of a full-sister to Easy Goer. His tail-female great-grandsire is out of the hard-knocking distance mare Drumtop, a daughter of Round Table who set two course records at 1 1/2 miles and one at 1 1/4 miles and beat colts on several occasions in graded stakes, including the 1 5/8-mile Canadian International. And his tail-female family traces to Nodouble, one of the toughest horses I’ve ever seen, who has passed on that toughness to his offspring, and also to Tom Rolfe, another tough horse who carries on the Ribot line. He’s inbred 5x5 to Buckpasser and 4x5x5 to Secretariat, all through Big Red’s daughters. The key word with this colt’s family is ‘tough,’ and he’s definitely moving in the right direction. I have tremendous respect for Wildcat Red and Uncle Sigh, both for their brilliance and courage. I just don’t know how they’re going to cope with an expected hot pace, especially with Uncle Sigh getting blinkers on and working a bit faster than Contessa was looking for. The Wood in my mind is a virtual toss because of his bad start and appearing lost down the backstretch, as if, “What am I doing back here? Why are all those horses in front of me?” It’s too early to give up on him. As for Wildcat Red, even though 1 1/4 miles is a major question mark, you don’t want to take him on too early, because he’s not going anywhere and he’ll fight you every inch of the way. He could be the speed of the speed. I’m not sure what to make of Tapiture. I hate to forget about a horse who was once highly regarded just because of one fourth-place finish, but I have no feelings about him one way or the other. I always thought his pedigree was more geared toward 1 1/8 miles, but he has shown a great deal of ability, and whether he is going to regain his form stretching out another quarter of a mile I have no idea. Despite his disappointing effort in the Calder Derby at 1-5, I also still haven’t given up on Ring Weekend. I will give him a pass because of that surface, which was like running on the beach over deep sand. And after he bumped hard with the winner after turning for home, he pretty much called it a day. I believe he’s a much better horse than that, although the Tampa Bay form this year has not held up very well. Bayern’s plans have not been solidified, but his Arkansas Derby was a much better performance than it looked, considering the setback and layoff and the early pressure he was under. He still was running hard and trying in the stretch and only started to tire late. He should move way forward off this race, but the big question with him is having only three career starts. He sure does look more like a Preakness horse to me, as does Social Inclusion, who actually moved way up in my book after his courageous performance in the Wood Memorial, a race he appeared to desperately need. Vinceremos, who did very little running in the Blue Grass, looks to be a ‘go’ for the Derby, assuming he works well, which you know he will. Of all the horses sitting just below No. 20, one who intrigues me is Pablo Del Monte, but he needs several more defections so I’ll hold off on getting into him. WE MISS ARTIE is one horse we know prefers synthetic, and it looks as if the poor Blue Grass performance will have no bearing on HARRY’S HOLIDAY’S Derby status. Once you start getting close to that magical No. 20 spot, the more intense Derby fever becomes.